As has been reported by many LOST news outlets over the last few days there has been some additional information released about the LOST Auction. One non LOST related source is the Original Prop Blog pictured to the left. They also have an interview with Profiles in History that are the people running the auction. 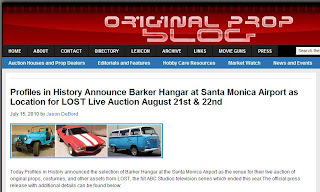 The essential details from the press release are that the auction will be "LIVE FROM BARKER HANGAR IN SANTA MONICA, CA AUGUST 21 AND 22, 2010"
Also for the non US citizen interested in this auction "Worldwide bidding begins at 1pm PST both days. Bids can be placed in person, via mail, phone, fax or live on the Internet......"
Here's to hoping we can go for free! How much do you think the shipping would be for a Dharma van to the UK? As long as they don't use GoMerch that is! I've still got my eye on Jughead. There is a space at the bottom of my garden crying out for a "feature". That would be really cool to have Jughead hanging up at the bottom of the garden. If anyone attends we want lots of pictures ! Bring on the catalog I say! :) That's pretty much going to be the extent of my purchasing and depth of my wallet. Tina Lau is still offering up items. Now if I can only figure what episode it came from. MAJOR REWATCH! @JPL Awesome! I was actually watching that piece, but was busy near end of auction so didn't bid. (Glad now, would have hated to be bidding against you.) Congrats! I've been picking up something from Tina's auctions every few days. I also need a rewatch to pinpoint episodes. - I also need a bigger house or an intervention. Just added a reminder about the sale to the front page, just in case anyone missed it the first time. I picked up a couple of things from the ebay auction. a nice clay pot, a cute bracelet yesterday,. I'm sure the catalog will be the only thing I can get but every time I see a VW van, I say something about it and my bf laughs. He says hey, there goes Dharma lol I say oh I want that. every time. My final poster just arrived ! Lots of positive thoughts to those that haven't had theirs yet. If I didn't know better I would be half inclined to believe that the pizza website was part of an ARG. That's exactly what I thought Zort! I thought my friend was just giving me a heads up to something, knowing my obsession with LOST. But it is a real pizza place. And my friend will be opening the third location shortly. I've picked up a few of the props from Tina's auction as well. Wonderful memories. Looking forward to Aug21/22 -- even if I end up with nothing it will still be an exciting time. Still very jealous of the plate from Juliet's kitchen, Rob! In a related note, Petula Clark's Downtown came on the radio on my way to work this morning. LOVE that S3 opening scene! My hubby and I plan on attending the Lost Auction in Santa Monica if...and it might be an big IF....we can get tickets (and they aren't priced crazy)! I've signed up with the site selling/distributing the tickets for email alerts. They will be available early August. Of course, I'll try to be your onsite reporter! Thanks Maven, you are our regular CA person on the spot. On vacation so this is a few days late but happy belated bday ChrisL! I'm on the auction email alert list, so I might try for an item or two, but will probably just settle for a catalog. Cheers Ray. Enjoy your break. @andalone ahh, was it you who bought these two items? I had my eye on both of those and was hoping that since they'd disappeared, it was because she was rejiggering the price or something, but I asked yesterday and she said they'd gone to someone who had bought many items. I've been keeping my eye on those auctions but still have yet to buy anything. I've tried bidding on a few of the jewelry items but usually get outbid and/or they end out of my price range. @beesknees7 No, I wasn't the one that purchased those items. Dharma shipping labels as well. I'll post pictures when I match them up with episodes. Half the fun has been going through screencaps and trying to match up items with the characters that I'd think they'd belong to. I did stumble upon a few matches like the ceramic kleenex holder and one of the wooden jewelry boxes, plus a bunch of the blue and white ceramic trinkets. I bought a nice ceramic pot with lid and one of the labels and the bracelet that just went yesterday. I'm keeping my eye on stuff there. I realized that I am missing a prime opportunity! This group is surely more knowledgeable than a casual viewer of LOST, and maybe someone will recognize some of the "unidentified" props I've purchased. I've linked episodes to 4 other purchases I've made, but these are the items I'm still trying to place. @Lisa Congrats on your items! @andalone I looked through the screencaps I have saved and the only one that looks pretty similar is the white thingy I circled from Faraday's house in The Variable, but it's really hard to tell from that angle. @beesknees7 Thanks! It's a start. I never realized how many items are in the background of each scene until I started trying to match things up. I have spent hours going through screencaps at lost-media.com - still searching. @andalone I made a bunch of Faraday-related screencaps since he's my favorite and I was trying to find something with ties to him. I had my eye on one of the globes which I thought was from his lab in Oxford. Anyway, Eloise's shop and Kate & Hurley's houses seem to have the biggest number of little trinkets and background items. If anybody is still on here ABC is giving away a free mr.clucks key chain with any purchase! Hop on it! NEW POST and possibly a NEW ARG !